The Circus of the Blue Fly arrives in the Bug Forest for one night only. All the bugs want to see it – even the busy ants take a day off. But when Siira finally gets to the circus, gone are the tent, flying stars, gold glitter and applause. Somewhere, in the dark of the woods, gleams a warm light that changes the grief-stricken Siira’s life irrevocably. 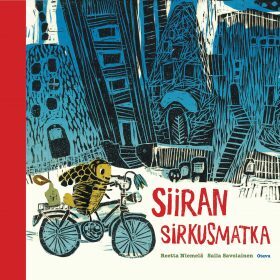 A poetic and beautifully illustrated fairy tale starring a sensitive bug named Siira, who only wants to see the circus.